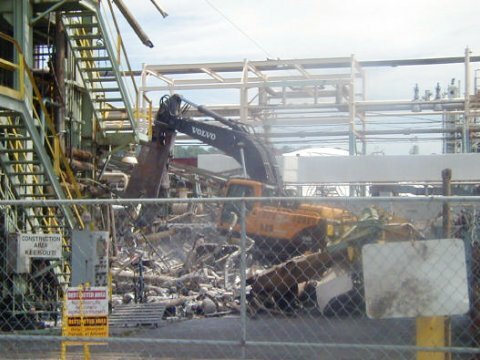 Bayer New Martinsville Plant | North American Dismantling Corp. This project consisted of the purchase and dismantling of approximately (42) Units/Buildings spread across a 200 acre site. 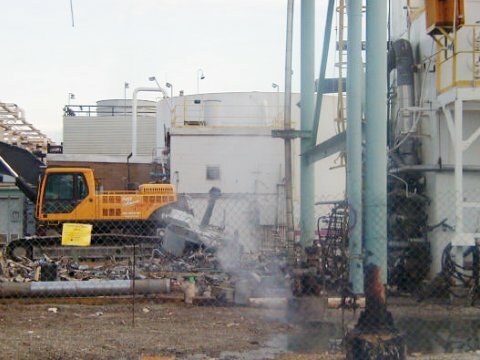 All environmental cleaning and remediation was performed by the Owner prior to North American Dismantling performing any work. 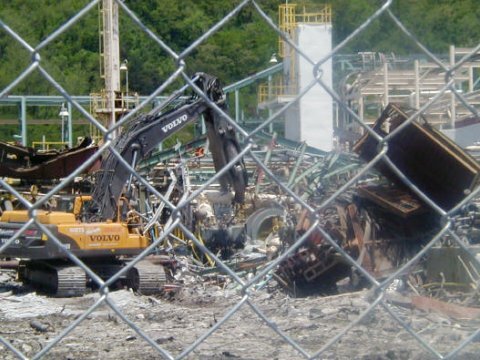 North American Dismantling surgically removed specified buildings/units at the Bayer New Martinsville Plant while working in close proximity of other Major Chemical Units that were to REMAIN. Prior to North American Dismantling mobilizing onsite an extensive F.B.I. background check for every employee and Subcontractor employee were completed per the Bayer Corporation requirements. 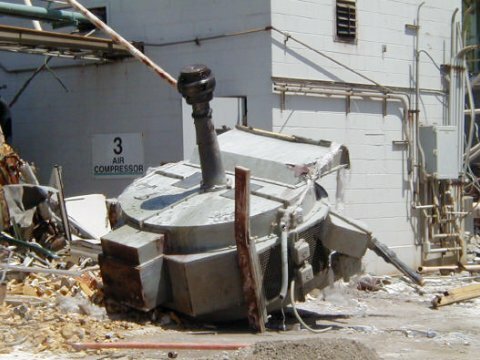 Among the demolished units were the Reformer, HCL, MDA I, MDA II, MR I and MR II units. 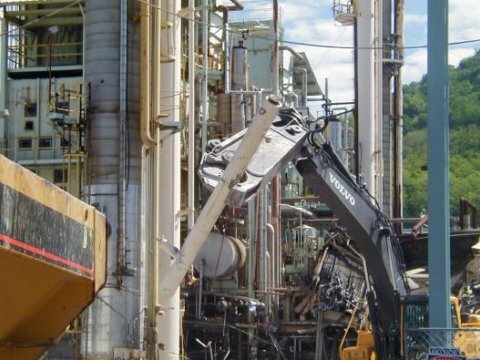 These specific units were labeled as chemical and physical hazards on the project and North American Dismantling obtained the proper awareness training and necessary PPE required for working in all areas. The buildings/units consisted of various process equipment, piping, platforms, and vessels. Included in the scope of work were the removal and recycling of all exterior concrete and asphalt associated with the specific building/unit totaling over 200,000 square feet of hard surfacing. 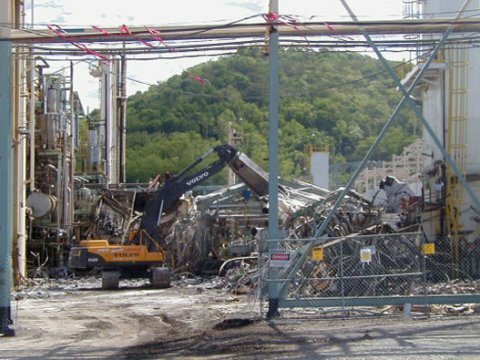 In addition to the original contract, North American Dismantling completed the removal of the Polycarbonate Building which consisted of a 4-story steel structure with block walls and concrete floors. This particular structure was approximately 75,000 square feet and approximately 65’0” in height. This building was adjacent to a structure which was to REMAIN and to be protected during the demolition operations. 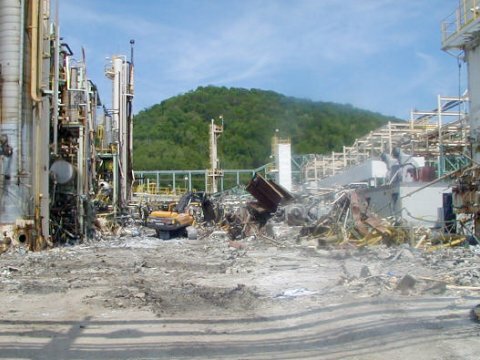 North American Dismantling was responsible for crushing all non-hazardous concrete, mortar, bricks, and brick concrete and used the material to backfill the affected areas to the original pre-demolition elevations. At the completion of the work, North American Dismantling graded and covered all affected areas with a 3” thick layer of limestone throughout the entire site to complete the project. 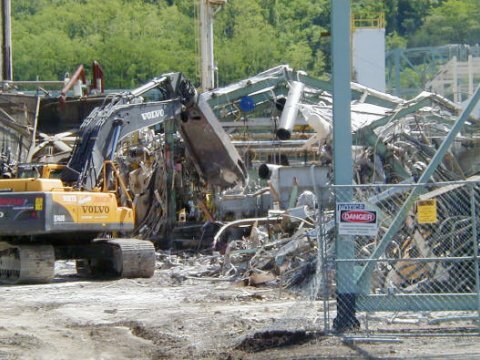 Removal of approximately 200,000 square feet of buildings/units and foundations spread across a 200 acre site. Removal of the Polycarbonate Building which consisted of approximately 75,000 square feet and 65’-0” tall steel structure. North American Dismantling completed this project within its specified budget and 4 months ahead of its anticipated completion.